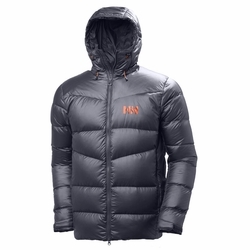 Helly Hansen Vanir Icefall Down Jacket. This technical down jacket is developed based on years of professional users input and testing. Featuring lightweight and clean design with added durability and protection from the use of strategically placed water resistant Primaloft Silver insulation.